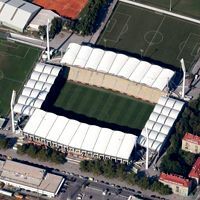 Vienna: New stadium for Rapid to be decided in November? The club was expected to release details this summer, but has postponed its announcement to autumn, most likely November. What will the 25,000-seater be like and where will it fit? Rapid Wien has been planning a stadium development for a few years now and should the initial plans be carried out, we would already see the arena standing. But instead Rapid is still playing at outdating Hanappi Stadion. Today the ground is under 19,000 and puts Rapid well below Europe’s top clubs in terms of attendance and revenues. Details of the supposed 25,000-capacity new stadium were to be disclosed this summer, but will not, apparently. The club has moved the date to autumn as two experts are still analyzing how to keep Rapid in their historical home, the district of Hütteldorf, which is very densely populated. Integrating the infrastructure to accommodate intensive traffic on matchdays is a major issue here, aside from the blueprint difficult to be fitted into the existing urban fabric. It is expected details will be announced in November. This is when current club president, Rudolf Edlinger, steps down and he is thought to be leaving a legacy of the project established for his successor to carry on. Building the stadium would be up to Erich Kirisits, who is thought to be elected in November. The new stadium is thought to cost around €45 million ($60m), of which €20m ($26) will be provided by the municipality of Vienna. Rapid also hopes to gather private funding, luring investors with the promise of building something exemplary for entire Europe.